To establish them in a local church for Christian living. We endeavour to do this through various ministries to children and young people, together with other Christians and local evangelical churches. Child Evangelism Fellowship is the world’s largest evangelistic outreach to children, reaching over 19 million children in over 190 countries each year. We have a general brochure with more information about different CEF ministries available for download. The verbal inspiration of the Scriptures. The perfect humanity and deity of the Lord Jesus Christ. The atoning death and bodily resurrection of the Lord Jesus Christ. The personal return of the Lord Jesus Christ. The reality of Satan, hell and heaven. Our full Statement of Faith is available for download. 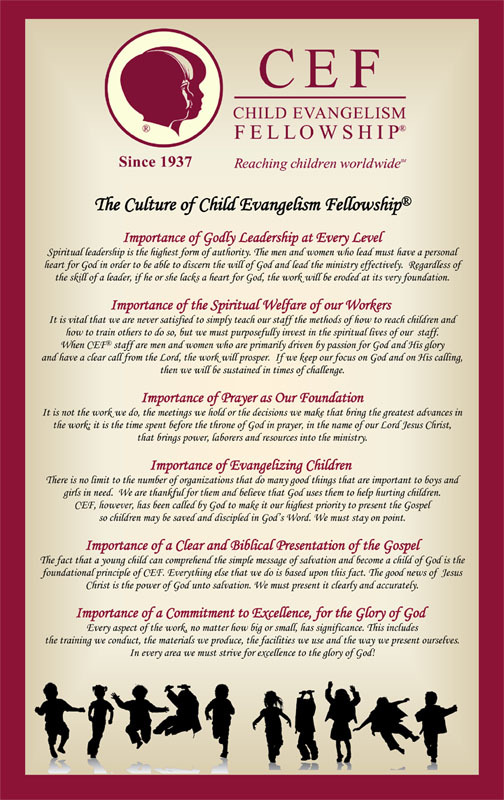 The whole “The Culture of Child Evangelism Fellowship” document is available for download.